Robbie Williams is celebrating his first solo UK number one hit for eight years after Candy topped the official singles chart. It is the 14th number one of his career - including Take That - meaning he has drawn level with bandmate Gary Barlow, who co-wrote the song. Some 137,000 copies of Candy were sold this week according to the Official Charts Company, making it the fastest-selling single by a male artist this year. The track is from his new album Take the Crown, which is released on Monday. 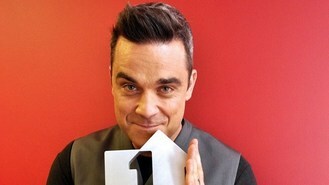 Williams told OfficialCharts.com: "Number one... yeah! So chuffed. Really really happy that Candy reached the top spot. Good work Team Williams and thanks to everyone who got it there. I'm so excited about this album and this is a great start." The singer became a father in September after wife Ayda gave birth to their first child Theodora Rose. Last week's chart topper Labrinth featuring Emeli Sande dropped to number two with Beneath Your Beautiful. In addition to Williams, the only other new entry in the top 20 was Wiley featuring Skepta, JME and Ms D with Can You Hear Me (Ayayaya). Swedish House Mafia are still riding high with their anthem Don't You Worry Child at number four, while Adele climbs two places to number five with James Bond theme Skyfall. Meanwhile Scottish DJ, songwriter and producer Calvin Harris secured his second number one with 18 Months, keeping Kylie Mingoue's The Abbey Road Sessions in second place. Emeli Sande dropped one spot to number three with Our Version of Events, while Some Nights by Fun rose from 33 to four. Last week's number one, Taylor Swift, fell to number five with her fourth LP Red. Idris Elba has made his debut as a director - on a Mumford And Sons' music video. Kylie Minogue has announced that she is already working on a new album. Plan B has reportedly revealed that he is taking a year off from "the celebrity circuit". Chart veteran Engelbert Humperdinck has teamed up with Sir Elton John for the first time to work on a duet. Rival talent show judges Jessie J and Tulisa Contostavlos will battle it out to be crowned queen of the Mobo Awards. Rock veterans Status Quo are to reunite their classic original line-up for a series of shows next year, they have announced. Michael Buble has added four more dates to his London residency next summer, after they sold out in less than five minutes.